We've reviewed the latest independent ratings and awards to list the best UK health insurance policies. You can compare quotes and cover from these companies using Activequote.com. Activequote also offers free, regulated advice over the phone. Want to compare cover? Check out our list of the best health insurance providers in the UK. Learn more about the providers with our health insurance reviews further down this article or check out our guide to the cost of private health insurance. What does 'unlimited' cover really mean? We combined customer ratings from Reviewcentre.com with an independent financial researcher's rating of the quality and comprehensiveness of the policies. Reviewcentre.com reviews are written by people who have bought with that insurer and experienced their customer service. We also looked at recent awards the companies have won for their health cover. The list was updated in March 2018. Surprisingly, one of the largest health insurers, The Exeter does not make the top ten but we cover it in more detail in our reviews below. Some of the smaller providers in the top 10 appear to be competing by offering a similar range of policies to the big companies, but with a focus on customer service. Bupa scores five out of five for the comprehensiveness of its products but it does not have a high score on Reviewcentre. Saga also scores well for comprehensiveness but does not do as well on customer reviews. All of the providers in our list score at least four out of five for comprehensiveness. Axa has the highest customer rating. This is a helpful reminder not to rely just on brand when choosing health insurance but to research the help they offer. Using a health insurance comparison site like Activequote.com can save hours of shopping around; their site allows you to filter policies by price, features and you can even get free professional advice over the phone while you're using the site to help you choose. Health insurance can be one of the most important insurance purchases an individual or family makes – the convenience and security health cover provides can be critical. People buy health insurance for a variety of reasons (see Is Health Insurance Worth Having?) and the private medical insurance market is growing in the UK so new products and health insurance companies are emerging, adding to the bewildering array of options. You can easily compare prices using a comparison site (Activequote.com is a specialist health and life insurance comparison site) but it pays to understand the details of the companies and policies that those prices represent. Most of the companies in our top 10 are listed by Activequote and they all score well across a range of criteria. However, to find the best health insurance to suit your needs you need to think about the reasons you want private medical cover and what your budget is. Some of the top-rated providers may not have hospitals or medical facilities near to your house or they may offer comprehensive policies that are out of your price range. Health policies can be flexible so tailor the cover to your needs when getting a quote and make sure it is within your budget. You can learn more with our guide to what private health insurance costs. 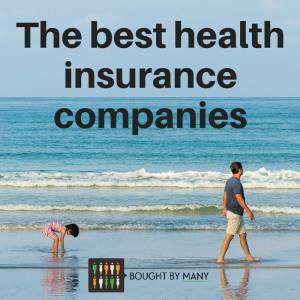 This guide reviews each of the top health insurance policies and companies in the UK, as defined by our top 10 plus the biggest names that didn't make the list. Health insurance / Private Medical Insurance - In the UK health insurance is also called private medical insurance. These policies can provide cover for different kinds of medical diagnosis and treatment both in hospital and as an out-patient. The degree of cover varies depending on the policy and company, but they are typically the most comprehensive type of cover compared with the other options below. With the rising costs of healthcare, these policies can also be the most expensive – someone in their early thirties might pay £25-£40 per month, while someone in their 40s can easily pay upwards of £40 a month. Prices tend to rise the older the individual is. The level of cover will also influence the price. Cancer cover - for some individuals private health insurance may be unaffordable, but they may be concerned about suffering an extreme illness such as cancer. Insurers have created ‘cancer cover’ products - AXA PPP’s example is the Cancer CashCover plan, which pays a lump sum (up to £60,000) if you are diagnosed with cancer. That money is then yours to spend as you wish – perhaps to help cope with the drop in income or increased expenses that may occur due to your illness. AXA's policy also provides access to dedicated cancer nurses for support and will pay for approved cancer drugs if they are prescribed to you but are not available on the NHS. The advantage of these policies is that they work out cheaper than private medical cover – a 30-year-old non-smoker can pay from £9.99 per month for the maximum £60,000 cover. Take care to read the terms and conditions to be sure the definition of 'being diagnosed' with a condition is clear, as this is the main factor in deciding if and when the policy will pay out. Cash Plans - another type of UK health cover is the Cash Plan. It is intended for the less expensive but regular health costs you might incur – such as paying for opticians, chiropodists and physiotherapists. As a result, it is important to see it separately from health insurance or private medical cover itself. Many cash plans operate as a percentage cashback scheme, meaning they only pay a percentage (often 50% or 75%) of the costs incurred rather than the full amount. People have sometimes viewed this as health insurance that pays half the cost, but a critical difference for a cash plan is the amount that you can claim. Cash plans typically limit you to claiming £50 to £400 a year for each of the categories of treatment, depending on the policy you choose, whereas a full Health Insurance policy may have a higher limit or might not limit payments at all. As such, cash plan policies are cheaper – MoneySavingExpert.com quoted cover from £14 per month in December 2014. However, it is worth weighing this up versus the fact that cover limits are lower and more notably, major hospital treatments are not covered at all as they would be with a full health insurance policy. The risks of a person needing medical treatment vary depending on their personal circumstance. For example, an older person who has smoked all their life is more likely to require medical treatment than a younger non-smoker. And if you've quit smoking but you're still vaping, there's a chance your health insurance premiums are higher than someone who doesn't vape. Most health insurance providers treat vapers the same as smokers because the companies usually ask about nicotine consumption, rather than specifically smoking cigarettes. According to a survey we conducted, 43% of vapers are unaware their insurance premium can be higher from vaping. Moreover, if you assume a question about smoking only applies to cigarettes and therefore answer incorrectly, you may invalidate your health insurance. It's best to ask your insurer if you're uncertain whether to say you vape or not. Have a look at our article for more information on vaping and health and life insurance. We've teamed up with Activequote to get vapers a 10% cashback deal on health insurance. Just join our group to get a quote. Health insurers take these personal circumstances into account when they calculate your premium and give you a quote for health insurance. We investigated how health insurance cost can vary in detail in our article what does private health insurance cost?. You can get online health insurance quotes that allow you to see this working in practice - most health insurers will ask you for your age (or date of birth) plus postcode and maybe a small number of other questions. Combined with the cover you are choosing, this gives you a price. This means it is hard to give a specific 'cost' of private health insurance as a young person in a cheaper postcode can pay under £20 a month with limited cover, whereas an older person in central London requiring comprehensive cover can easily pay over £100 a month. You can compare health insurance quotes online for your own circumstances from multiple providers in minutes using Activequote.com, a specialist price comparison site for health insurance. You can even use it to get free professional advice over the phone. We've also listed how much it would cost to pay for individual private treatments without health insurance. As a rule, pre-existing conditions aren’t covered by health insurers. Exactly how these conditions are treated will depend on the terms of the insurer and the underwriting method you choose when taking out your policy. We've writen an in-depth piece on the health insurance for people with pre-existing medical conditions and we have a group for travel insurance for medical conditions also offers information on getting cover. Pre-existing conditions are something older people might need to take into account. We've also a written a guide to health insurance for older people. Each insurer will have a set of conditions that are simply not covered (whether pre-existing or not). These will typically include chronic conditions (long-term conditions that require ongoing treatment and monitoring) such as diabetes and hypertension, but also include procedures such as cosmetic surgery that are deemed to be ‘not medically necessary’. These exclusions are laid out in the policy documents or T&Cs of each insurer. When you are getting a quote, you can choose several different underwriting options – if you have any pre-existing conditions that are not on the exclusion list, then these different options will change how the conditions are treated in the future. Full Medical Underwriting – with this option, insurers ask for your medical history and go through your circumstances in detail to arrive at a price and their cover terms. You will need to check these terms in detail because for each pre-existing condition they may decide to exclude it completely, exclude it for a specific period of time after which it is then covered (assuming no symptoms in the meantime) or include it. Moratorium – with this option, there is no need to submit any medical information or history. The terms typically state that you are not covered for any medical condition that you have had in the last five years and that this remains the case for the first two years of the policy. If you are trouble-free (it’s important to be clear on what each insurer’s definition of ‘trouble-free’ is) of any pre-existing conditions throughout those two years, then you will be covered for all conditions from year three onwards. If you join from another health insurer, the moratorium period may be carried over rather than starting again. It’s worth noting that if you do make a claim, the insurer is likely to ask for information about your medical history at that point to confirm that the claim doesn’t relate to a pre-existing condition. Continued Cover – some insurers will accept a continuation of cover – that is copying all the existing exclusions on your current policy from another provider. In this case, there could be some variations in terms so you should check and see that there are no material differences when considering a switch. The cover you choose depends on a wide range of personal circumstances and the prices offered. Some will see the benefit of going through the longer, more intrusive Full Medical Underwriting process as it gives greater clarity on what will and what will not be covered before you buy. Others prefer the convenience of the Moratorium process when buying and accept that there’s a possibility that when they make a claim it might be turned down if their medical history shows it was or is related to a condition that existed prior to buying the policy. Note that several insurers only offer Moratorium underwriting when you buy online, as the Full Medical Underwriting process requires in-depth discussion about your medical history and is best done over the phone or through dedicated forms. If you are looking for Full Medical Underwriting, then it is worth calling the insurer to understand the best way to do that. General and Medical are one health insurer who offer a specific option to cover pre-existing conditions. For a limited list of conditions (including diabetes and hypertension) it allows you to add £1,000 of cover for that condition in the first year. If you remain claim-free for the year, this rises to £2,000 in the second year. This cycle repeats up to a maximum of £10,000 for the condition after 10 years claim-free. This option allows people to get at least some cover for conditions that are under control and are unlikely to cause a serious illness but might need some minor treatment. You can begin or inform your search with Activequote.com - its comparison service allows you to select the features you are interested in when comparing policies (including policies from General and Medical), making it easier and clearer to see what you are getting for your money. Can I get Dental Health Insurance and what’s covered? Dental issues are often excluded from UK Health Insurance policies. However, there are some exceptions and some ways that dental cover can be included, depending on the provider and the dental work in question. If dental cover is important, it's worth comparing policies. For example, Bupa does not offer any dental cover with its health insurance policy, instead, it has a separate dental product that can be bought independently of health cover. Vitality and Aviva cover ‘oral surgery’ – this tends to mean you are covered for more extensive procedures – these are typically those for which your dentist has referred you to a hospital or those that are reconstructive in nature following an accident. However, you would not be covered for treatments that your dentist carries out. Routine treatment can be covered as an add-on. An Aviva add-on can cover up to £300 of treatment per year (with a £50 excess). Similarly, Vitality provides two levels of cover as add-ons; one for major dental work (like root canals) and one for major and routine treatments (like check-ups and polishing). Finally, AXA offers an add-on that pays 80% cashback on dental treatments up to £300 per year. These are only examples of the policies available – always ensure you check the terms and conditions of your policy to be sure you understand the cover you are buying. To help, you can compare the levels of dental cover for different policies using Activequote.com. Can I get Expat Health Insurance or International Health Insurance? On a standard health insurance policy, most UK companies will not cover any treatment costs that are incurred outside the UK. Therefore, regular travellers, expatriates or those heading abroad for extended periods may need to look for alternative options. You can get specialist advice and quotes for international health insurance from ActiveQuote. Bupa does not offer any cover whereas AXA and Vitality allow you to select an option that bolts on cover similar to travel insurance. It is worth comparing the cost of this against separate travel cover, as in the case of AXA the policy only provides for medical expenses but does not cover baggage or cancellation as is usually the case for travel policies. If you want to compare policies that do or can include travel insurance, you can do so by using Activequote.com. Finally, Aviva will cover emergency treatments abroad for acute conditions. A policyholder is covered abroad for up to 90 days in a policy year (note that breaching this limit voids your cover – i.e. if you abroad for 91 days, then you would not be covered for any days at all, rather than just having 1 day uncovered). However, International Health Insurance policies do exist. International Health Insurance is aimed at non-UK residents – that might be people relocating for work – and usually requires you to specify the region(s) you want to be covered in, what medical situations you want covered and what excess you are happy with. Both Bupa and AXA provide this cover, as well as lesser-known providers such as Freedom Health Insurance. There are differing wordings regarding pregnancy in health insurance. Pregnancy is generally viewed as ‘not an illness’, which, while technically correct, is not reassuring for expecting mothers and fathers. The health insurance policy documents can be vague or confusing in relation to pregnancy, describing that ‘routine’ pregnancy is not covered. However, insurers make various statements regarding pregnancy complications, indicating that some events would be covered. Bupa’s online support staff indicate that conditions threatening the life of the mother would be likely to be covered, although their policy summary document describes that they do not routinely cover pregnancy. AXA goes a step further and while similarly ruling out cover for ‘routine’ pregnancy, it may cover medical conditions developed during pregnancy. It also provides a list of conditions that would be covered in its policy documents, including costs for treating ectopic pregnancies, retained placentas and miscarriages requiring immediate surgical treatment. Aviva has a similar system to AXA, whereas Vitality leave the terms somewhat less clear, saying that it ‘may’ cover ‘some’ related conditions, so it is best to discuss it with the company if you are considering a policy and are concerned about the pregnancy cover. Freedom Health Insurance offers cover for pregnancy complications in its add-on ‘Executive benefits’ package. It also pays a pregnancy and maternity benefit. These, and other features, can be compared across providers and policy levels using Activequote.com. For more information, read our in-depth article on pregnancy and health insurance. Insurers differentiate between cosmetic surgery and reconstructive surgery. For example, AXA makes that distinction and is happy to cover what it calls the ‘first reconstructive surgery’ – that is plastic surgery that is necessary following an accident or as a result of surgery for a covered medical condition. It says that it will not cover any treatment that then relates to the reconstruction. AXA separates out ‘cosmetic’ surgery and will not cover it, nor will it cover conditions relating to previous cosmetic surgery. Breast reduction is a topic that is specifically drawn out by Vitality, which states it will not cover it, whether or not for psychological or medical reasons. Similarly, AXA does not cover it for either gender. Bupa states that non-essential surgery is not covered but does not go into details on how that is defined. Which is the best health insurance that covers complementary therapies? Complementary therapies are usually considered in their own category by health insurers. They typically comprise chiropody, chiropractic treatments, homoeopathy and acupuncture. Be aware though that each insurer’s definition varies with some classing physiotherapy as complementary. Dietary services can also be classed as complementary. Health insurers often offer complementary therapies as an add-on option to their core cover. AXA’s option provides £1,000 for all complementary therapies in total and allows a maximum of 10 GP-referred appointments in any one year. Aviva similarly restricts policyholders to 10 appointments but doesn’t apply a monetary limit. Vitality allows you to exclude complementary therapies to lower your premium, or select from two cover levels. The first limits you to £350 whereas the second provides unlimited cover. The levels of complementary therapy and the premiums resulting can be compared across providers and policy levels by using Activequote.com. Is 'unlimited' cover really unlimited? The top levels of cover provided by different policies usually describe the amounts insured as ‘unlimited’ or similar. This wording gives a message of comfort in the sense that no matter what the bill, your cover will apply. However, in practice, there may be features of your policy or small print that means this is not the case. When you get a quote, companies will highlight some of these cases. For example, you are asked to select the hospitals you would like to be eligible for treatment in – should you need or prefer treatment at another hospital then you would not be covered. But some restrictions are less clear and can be equally important. For example, Bupa and AXA will cover specialist and surgeon fees in full, but critically, that’s only true if they are charged at the approved rates for the procedure you are having. In practice, consultants are technically free to decide their own fees, so if they choose to charge more then the insurer may not pay the full amount. Often this isn’t a problem because many doctors choose to charge the approved rates. But sometimes your specific situation or location can mean there’s no option at the approved rates and you’ll be left out of pocket – the topic was reported on by The Daily Mail in 2012. It’s also worth bearing in mind that there’s more than one person needed for an operation. For example, anaesthetists are just as critical to a procedure and you will also have to cover their fees. It’s hard to know in advance what treatment you’re going to need and therefore whether there’s a specialist nearby. So when buying, it is worth exploring with the insurer to understand whether you should put extra money aside in case of a shortfall. Customer reviews can be helpful in understanding how comprehensive cover can be in practice. It's worth sifting through a few of the bad reviews (if any exist) as they can often relate to a situation where they did not receive a payout, despite the customer expecting to be covered. Note down any questions you have when reading the terms and conditions of the policy and contact the insurer directly to ask about them before buying. If you would like more information on the providers at the top of our list have a look at our detailed reviews. We hope to add reviews of more providers from our list, as well as others on the market, in the coming weeks. There are four companies that dominate UK health insurance and have a 90% market share between them. The other firms make up the remaining 10%. This section gives a brief overview of the four biggest UK health insurers and a fifth that has high search demand. Vitality used to be known as PruHealth. It aims to keep its customers healthy by offering a range of rewards and discounts relating to health and leisure. It has had a big marketing push in recent years, with campaigns fronted by the likes of Jessica Ennis-Hill. Read our full review here. Bupa is a giant in health insurance. It launched two years before the NHS and owns hospitals, care homes and dental centres. It offers private care for individuals and through some companies' benefit schemes. Read our full review here. Aviva used to be called Norwich Union and it is the biggest insurer in the UK. Its history stretches back more than 300 years and it deals with millions of claims around the world every year. Read our full review here. The company launched in 1940 and has become one of the biggest health insurance providers in the UK. It was named 2013's Best Healthcare Provider by Your Money. Read our full review here. WPA is not one of the big four but there is a large amount of online search demand for it. It is a not-for-profit private medical insurer and it does not participate in capped payout or fee assured schemes. Read our full review here. Find out the important information about the best health insurance in the UK. Vitality offers health and life insurance. This review is about their Private Health Insurance policy (previously called "PruHealth") - you can read our Vitality Life Insurance review separately. Vitality has a unique offering in the UK Health Insurance market. The company combines its healthcare offer with a set of discounts and rewards for healthy activities. Vitality's thinking is that if you are healthier, you’ll claim less. The headline offer is 50% off a Virgin Active gym membership. It uses technology such as wearables and logging trips to the gym to monitor your healthy activity. You can compare Vitality to other health insurance providers at Activequote.com. Vitality’s health insurance compares well with the best in the market. Independent financial researcher Defaqto gives Vitality's Personal Healthcare policy its top 5 Star ranking. A 5 Star policy is "an excellent product with a comprehensive range of features and benefits". The Vitality product starts with Core Cover, which offers in- and day-patient treatments gives “full cancer cover” (see their terms and conditions for more detail), covers MRI, CT and PET scans and pregnancy complications. Rather than having set cover levels to choose from, Vitality allows you to tailor cover to your needs. You can set cover levels for several categories of treatment such as outpatient treatment, diagnostics, psychiatric, dental and even travel insurance. Remember that while limiting cover will lower your premium, it can also limit the treatment you will be able to receive. Vitality's health and leisure rewards and discounts are unique features of the policy. They are intended to help customers understand their health, take part in healthy activities and be rewarded for them. Vitality customers have access to health checks and get 50% reductions on medical screening tests with selected providers. To help customers engage with their health they get cashback and discounts with health brands and shops. For example, 50% off Virgin Active monthly gym fees, 50% cashback on bikes at Evans Cycles or 50% off Sweatshop sports shoes. Rewards include further discounts that help you to relax and unwind, including discounted BA flights, reduced Eurostar travel, money off boutique hotel stays with Mr and Mrs Smith and up to 75% off Champneys spa stays. Additionally, with enough steps logged, your activity can earn you a free cinema ticket and a Starbucks Coffee each week. You can get an online health insurance quote from Vitality via their website and over the phone. To see if they are right for you, compare Vitality policies versus the market at Activequote.com. For more in-depth information, you can also read our full Vitality Health Insurance review. BUPA sells the most health insurance policies in the UK. It has boiled down its range to two levels of cover. ‘Comprehensive’ is the top level and provides cover for diagnosis (including consultations, PET, MRI and CT scans plus other diagnostic tests) as well as getting treated (including hospital and out-patient treatments as well as mental health therapies). 'Treatment and Care' allows you to be diagnosed by the NHS and then receive treatment privately. It includes two levels of cancer cover. You can compare Bupa to other health insurance companies at Activequote.com. Bupa’s policies have fewer options to choose from compared with other providers, asking you only to decide on what levels of out-patient and cancer cover you want, as well as the excess level you are comfortable with. BUPA's, market-leading position includes ownership of hospitals, care homes and dental practices so you’d hope they understand customers’ health needs and how to treat them well. With 2.7m customers (December 2012) there’s a variety of experiences that can be found in customer review sites, but Twitter suggests some are very positive. However, on Reviewcentre.com it scores 1.4 out of 5 from over 120 reviews. You can see how it compares with other providers using the Activequote.com comparison site. For more in-depth information, you can also read our full BUPA Health Insurance review. AXA is the second-largest provider health insurance provider in the UK and it's Bupa's main competitor. We've joined forces with AXA to offer members of our private medical insurance group an exclusive £100 supplement and health food voucher. Join the group to access to the deal. Its Health Select policy offers 9 options that can be selected to enhance its basic cover. You can see how AXA compares with Bupa and other providers at activequote.com. AXA's add-ons include out-patient, therapies, mental health, ‘extra care’ (which includes cover for home care, chiropody and oral surgery), dentist and optician cashback, extra cancer care and travel Insurance for medical cover when you are outside the UK. The eagle-eyed will note that is only seven add-on packages – the other two variables that affect your cover and price are the level of excess you choose (£0, £100, £250 or £500) and whether or not you opt for AXA's ‘6-week rule’. This 6-week rule is intended to allow you to get access to private treatment when NHS waiting times are long, but avoid making a claim when the NHS waiting list is short. If you opt for the 6-week rule, you'll agree to NHS treatment you within 6 weeks of diagnosis - you must take that route and private treatment is not covered. If the NHS waiting list is longer than 6 weeks, then you’re covered for private treatment. Your premium will be lower to reflect the fact that you may use NHS treatment in some cases (it works similarly to Saga's 4-week option - AXA is Saga's health insurance underwriter so it is no surprise to see some similarity in their products). AXA allows you to get online health insurance quotes and you can compare their policies with others in the market using Activequote.com. For more in-depth information, you can also read our full AXA Health Insurance review. Aviva is one of the UK’s largest insurance companies and deals with almost every type of cover. You can get a quote for Aviva health insurance at Activequote.com. It only offers one policy level – Healthier Solutions – which can be tailored through a series of optional add-ons. Aviva highlights the importance of getting the balance right between paying less and having enough cover. Aviva has a range of options to help keep costs down. Their 6-week wait option kicks in when treatment on the NHS is not possible within 6 weeks (similar to AXA and Saga's policies) - helpful if you're happy to go with NHS service but have private medical insurance as a 'backup' when waiting lists are long. Aviva offers a choice of excess levels (the amount of a claim you pay yourself before your cover kicks in) so you can reduce your premium heavily if opting for the £5,000 option. Of course, this means you will be responsible for the first £5,000 of costs each year, so even some significant treatments and expenses would not be covered. Finally, you can choose the hospitals you can access, which allows you to select local options that cost less. Bear in mind that using all of these options, while reducing your premium heavily, would lead to cover that only kicks in at certain hospitals when costs are over £5,000 and if treatment isn't available on the NHS! If you are seeking more cover (and consequently a higher premium), Aviva's cover can include psychiatric treatment, dental and optical cover and therapies cover. Aviva also allows you to protect your no claims discount (when you've earned it) and extend the list of UK hospitals you can use if you wish. Once you have a rough idea of the cover you'd like, make sure you check Aviva's terms and conditions to ensure you are getting what you expect. Aviva also offers policies for specific problems or concerns such as its Child Health Essentials, Cancer Essentials and Physio Essentials policies. Aviva offers private health insurance online quotes through its website and over the phone. You can also compare their policies against the rest of the UK market using Activequote.com. For more in-depth information, you can also read our full Aviva Health Insurance review. APRIL UK withdrew from the UK health insurance market in July 2018. It revealed it had stopped taking new customers and anyone with an APRIL policy would not be able to renew at the end of their policy year. The news could leave some customers who developed a condition while they had an APRIL policy or develop one before their cover ends in a difficult position. When their policy ends they may want to shop around for a new health insurance company but conditions that developed while they had an APRIL policy will be classed as pre-existing conditions and are unlikely to be covered. Read our guide to getting health insurance for pre-existing conditions. APRIL UK launched in 1997 and serves 6 million customers across more than 30 countries. APRIL UK came top of our list of the best health insurers in 2016 as a result of their overwhelmingly positive customer reviews. Read more in our in-depth APRIL UK Health Insurance Review. Health-On-Line is a newer insurance company, founded in 2000 with the aim of bringing a fresh and new approach to health insurance. Since then it has grown rapidly (it paid out over £800m in claims in 2013) and is part of the AXA Group. In fact, the companies are closely integrated - Health-on-Line's salespeople can advise you and sell you both a Health-on-Line policy or an AXA policy. Health-On-Line aims to give you control over your cover, offering modules and choices to tailor it to your needs. It puts an emphasis on making health insurance easier and more accessible for people, for example, by aiming to minimise jargon. It also focuses on customer service - when you have an enquiry you are handed back to the same person who sold you your policy so that you are always in touch with the same person. Health-On-Line calls this the Dedicated Account Manager service. AXA underwrites all of Health-On-Line's policies, which may give some people a sense of extra security and comfort because it's a newer brand. Heath-On-Line offers four main types of cover. The first is Heart & Cancer Cover, a specialist Private Medical Insurance policy that focuses on heart conditions, cancer and strokes. It also offers a Priority Diagnostics policy, which helps customers who want to have the speed and choice of private care during diagnosis by giving access to specialist scans and tests. Health For You is its entry-level Private Medical Insurance policy - it covers heart and cancer care but also in-patient treatment for a range of other conditions or treatments. Finally, Health-on-Line offers Personal Health, which is the AXA PMI policy (see our AXA review). Health-on-Line also offers options to balance your cover with the overall premium. Its modules include options for out-patient treatments, therapies, mental health, dental and optician cashback as well as worldwide travel cover. It also allows you to reduce your cover in several ways to keep the policy within your budget. You can remove the private cancer cover, instead choosing to rely on the NHS, you can add an excess to your policy up to £5,000 and you can choose the 6-week wait option, which means your private medical insurance will only kick in if the NHS is unable to treat you within 6 weeks (making it a useful safety net for times when the NHS waiting lists are too long). Learn more in our in-depth Health-on-Line health insurance review. Saga's offer is aimed at over 50s and it has a range of health insurance products. Super is its top-of-the-range product, covering both in-patient and out-patient treatment as well as diagnostic procedures. For a number of categories - such as surgeon's fees, hospital fees, cancer treatments and diagnostic tests - there is no limit on the amount that can be claimed any year. However, there are limits placed on alternative treatments such as Homeopathy or Acupuncturists (£1,500 per year), psychiatric treatment (£1,500 per year) and dental surgery (cash benefit of £1,500 - see our Dental Cover section below). You can get a quote at the Saga website. Saga provides a number of options that allow you to reduce cover and lower your premium, or pay more to get greater cover. These include Extended Cancer Cover, varying levels of Excess and cover for Hypertension. A unique feature of Saga is its “4-week wait option”. This option reduces the premium, but in return, the policyholder has to accept NHS treatment if it is available within 4 weeks of the date of diagnosis. This is intended to provide a cost-effective method to get the advantages of rapid treatment when you need it, but avoid paying extra when you don’t. The full terms and conditions of these options can be seen on Saga's site. Saga health insurance's underwriter is AXA PPP. This set-up combines AXA's underwriting knowledge with Saga's focus on the over 50's market, with the intention of creating a product as a 'best buy' for the over 50s. You learn more about its products on Saga's site. Saga doesn't feature on comparison sites but it is always worth shopping around - you can compare a range of other health insurance policies using Activequote.com. Activequote allows you to filter by pricing and cover to see how they stack up vs Saga's own offering. Western Provident Association has three 4 Star products. Read our WPA Health Insurance review for more information. Perhaps less well-known than the other names in this list, the Permanent Health Company has been offering UK Private Medical Insurance since 1994. In addition, its policies are underwritten by AXA PPP, so while you might not recognise the name you are buying from, a big-name company is involved behind the scenes. The Permanent Health Company’s intent has been to offer a simple product to cut through the complexity of the UK Health insurance market. You can get a health insurance quote from the Permanent Health Company at Activequote.com. There are four policy levels and its top levels of cover are Plan 1 and Plan 2. Both provide extensive cover for in- and out-patient treatments, diagnostics, chemo and radiotherapies. However Plan 1 offers greater cover than Plan 2 on certain out-patient treatments – for example, Plan 1 covers 20 physiotherapy sessions per year without a limit, whereas Plan 2 only covers £750. The same is true for complementary medicine (defined as chiropractic, osteopathy, homoeopathy & acupuncture). Plan 1 also offers higher cash benefits if you choose to have treatment in an NHS hospital rather than going private (£200 per night with a max of £6,000 as opposed to £100 per night with a max of £2,000). The Permanent Health Company sells directly through its own website and over the phone. You can compare its policies and prices versus the market to find your own 'best buy' using activequote.com. For more in-depth information, you can also read our full PHC Health Insurance review. Freedom offers a unique feature in its Your Choice policy - it allows you to choose cover for a similar range of conditions and treatments to most other health insurance policies, however, it pays out differently. The usual process at most health insurers is that you get a claim approved, go to a medical facility for some sort of treatment and then pass the bill on to your health insurer who covers it. Freedom, instead, gives you cash - the amount depends on the claim and they leave it up to you how you will spend the money. This allows you to choose your hospital and specialists with freedom - you could even choose to use the money to travel abroad for treatment. You can even choose to keep the money and use the NHS. This degree of choice can be attractive but the downside is that unlike other health insurers, they won't pick up the bill if it exceeds the cash amount you are paid up front. So if your condition turns out to be very complicated, you may find the cash is insufficient (though Freedom aims to provide amounts that are suited to each treatment). You can read more in our in-depth Freedom Health Insurance review. CS Healthcare is aimed at the Civil Service and voluntary or charitable workers. Read our CS Healthcare health insurance review for more. The Exeter is a mutual health insurer, it has a comprehensive policy but dropped out of our top 10 in 2017 because we could not find enough customer reviews. Read our Exeter health insurance review for more. Generally & Medical was originally the supplier of health insurance for the medical profession. It offers eight policy levels with additional options for in-patient psychiatric treatment and worldwide travel that should mean you find the policy to suit your own needs. In addition, it also provides a unique option that allows you to get some cover for a pre-existing condition (which almost all medical insurers exclude), including diabetes and hypertension. The policy starts out with a low limit on claims relating to the condition in the first year, which increases every year you are claim free. This can be attractive for people with pre-existing conditions that are now under control. Learn more about getting health insurance for people with pre-existing medical conditions. General and Medical also offers a range of specialised private health insurance policies for sports people and are providers of health insurance for some large and well-known associations around the country such as the London Taxi Drivers' Association. You can read more in our in-depth General and Medical Health Insurance review. Alternatively you can compare all of these providers using Activequote.com's price and feature comparison service. HMCA offers a range of health and other insurance plans for members of trade, professional and membership groups. Its health cover is arranged through The Care Insurance Company Ltd, Gibraltar. It is not as well-known as other private medical insurers and it's fair to say its website and quote form feel behind the times compared with some other providers. However, there is no excess or age restrictions on any of its three medical care plans. Some things are excluded from its cover, such as emergency admissions to A&E, radiotherapy or chemotherapy and management of long-term illnesses, although its plans do pay cash grants towards radiotherapy or chemotherapy and for each night spent as an NHS patient. To get a quote you'll need to fill in an online form and they'll get in touch with you to discuss your options. It lists cover limits for its most comprehensive policy, The Medical Care Plan, here. Some cover limits look lower than other providers like Health-on-Line, who will pay for some treatments in full. However, HMCA's limits may be suitable for some people and their prices may be lower. It also offers cash plans, dental cover and income protection. You can compare UK health insurance policies and prices by using Activequote.com. Or join our health insurance group to get an exclusive deal with AXA PPP.